Undersleeve increases comfort by protecting the skin and minimizing chafing from a rigid brace. Easy to apply. Machine washable for convenience. Not made with natural rubber latex. Is the Cotton/Lycra Undersleeve right for me? Prevents chafing and skin irritation by a knee brace. Try our Brace Advisor for personalized product recommendations to meet your needs! DonJoy undersleeves help improve comfort and protect your skin from chafing. Also a great way to keep your leg and knee a bit warmer during cooler months while helping to control moisture during warmer times. 86% Cotton, 14% Lycra. It is a good idea to buy a pair of these so you can wash one while you wear the other. I had surgery for ACL several years ago. Now I have a slight ACL tear and small meniscus tear. I have a DonJoy brace but have lost the sleeve. It was rubber and provided support on its own. I only need the sleeve now. Is this one thick and tight enough to provide some support? I believe the sleeve you are looking for is the Neoprene Knee Brace Undersleeve. I wear the reaction web brace in XL/XXL, what size will I need in this? Also, will this prevent the rubbing on my arthroscopy scars? You should measure your leg just like you would to check sizing on a brace and go with the reccommeded size. Are there replacement pads and straps for the Donjoy knee braces? We do sell replacement parts for some of our knee braces. https://www.betterbraces.com/parts-and-accessories If it is not available on this website it can be purchased from DJO Global direct. I wear a custom ACL defiance brace when I play field hockey and lacrosse. I go to school in the south and my brace tends to fall down when I sweat a lot, would this undersleeve help? The DonJoy Undersleeve Cotton/Lycra for Knee Braces will help with skin irritation and chaffing, but not really control brace migration. The DonJoy Neoprene Undersleeve, is better suited for helping keep the brace up on the leg. I have a new DonJoy ACL Everyday bought from this site. I also purchased one sleeve just in case and it turns out I have to wear the sleeve due to some irritation from the brace and sweating. I need to order a few more sleeves to allow for washing. Before I choose the same basic sleeve, I noticed a girl in my Physical Therapy clinic with a custom ordered DonJoy (ordered by her dr for her to play sports) and her sleeve is Lycra/cotton with an opening at the knee cap. How do I get hold of one of those? I would prefer one or two of those in my collection for these humid summer months - as much air as possible when in the brace 24/7 ya know? Do you sell those sleeves with patella opening?? Unfortunately, the Cotton/Lycra DonJoy Undersleeve is not available with an open patella, only closed. The Neoprene Knee Sleeve does have an open patella. I have seen several requests for the sleeve to be in light colors . . . white or tan . . . it's a bit shameful that this request hasn't been met . . . what is the problem? I sweat with the black sleeve in the Summer months . . . and I'm a thin and fit person. I bought the OA brace for over $600. and can't get a sleeve for $25. in a light color. I'm a disappointed customer. We are sorry that you are not happy with the color of the undersleeve. Unfortunately the sleeve will not come in any other color than black. I have a large Playmaker FourcePoint brace because my measurements are calf - 16, thigh - 21 1/2, and mid knee - 15 3/4. However, I have read in some of the reviews that you need to buy two sizes bigger than your measurements. I need this sleeve because the brace is chaffing my inner thigh and the back of my knee. What size should I get with my measurements? My daughter wears the Defiance ACL brace or soccer and lacrosse. It chafes her behind the knee. I bought a neoprene sleeve and she hates how tight it is, so I'm looking at the cotton Lycra undersleeve. I measured upper as instructed 7" above middle of patella and its 18.25. Would you recommend this sleeve for her and what size? Her knee measures 14", mid- calf 13". I can not walk without holding my knee with force. Is there any locking brace available or not , which keep my foot straight at walking period . You would need to take a look at a brace that is not available on our website. It is the Playmaker with the droplock hinge. The hinge can be locked when you stand to keep the knee straight so it will not buckle. You would need to go through DJO India to see if you can get this brace. My daughter wears a Don Joy brace on her left knee and needs something to wear on her right leg to protect her leg from contact with her brace....would this sleeve be suitable? I wear 2 Futuro Sport baces, and lately I am breaking out in hives. The doctor said I should get an under sleeve to wear. Will the lyra/cotton sleeve keep my leg dry and will the braces stay in place? Is this material like yoga pant material? Also will it fade when washed in hot water? Thank you for your question. This request will be passed on. Do these sleeves come in any other color than black? I am wondering how hot to wear this during the summer? Thank you for your question. The under sleeves are designed to be worn under the rigid knee braces for various reasons ranging from skin irritations to suspension concerns. It is a thin breathable material and should not trap much heat inside. If you are looking for something other than an under sleeve to be worn under a rigid brace, please feel free to call product support 888-405-3251. Where on my brace would I be able to find what size it is? It appears that it is good to have the brace and sleeve size match. Do knee sleeves help the knee brace from slipping? Thank you for your question. The under sleeve can help with slipping in some situations. If you have questions about your brace sliding/slipping on you please call product support at 888-405-3251 to assist with your particular situation. Hi. I feel like the small leg sleeve would be a little big on me since I'm a tiny person. Is small the smallest size you or is there an extra small size available? If not, do you offer children sizes for leg sleeves? Thank you for your question. The DonJoy Undersleeve Cotton/Lycra for Knee Braces only comes in Small-XXL. The small fits a thigh of 15.5"-18.5", knee center of 13"-14" and calf of 12"-14". We do not have any undersleeves that are smaller than that on BetterBraces.com. If you wanted to order the DonJoy Reaction Knee Undersleeve in a XS you could order direct from DonJoy. You can call product support at 888-405-3251 for further information. Six inches above the middle of my patella (knee cap) my thigh measures 21". From the sizing chart it looks like I should order a Medium. Is that correct? My brace comes up 9" above the center of my patella. At that place my thigh measures 22". Does that affect the size I should buy? How long is the sleeve? My brace is 16" long; I would assume the sleeve needs to be longer than my brace. I wear a Don Joy knee brace similar to the "DonJoy FullForce Ligament Knee Brace" when I play hockey. I have found that my knee/shin pads tend to force the brace downward when I play do to sweat and pressure from the knee/shin pad. Will this product help to stabilize the brace or is there another product that someone would be willing to direct me towards? Thank you for your question. The DonJoy Under sleeve is designed to be worn under a rigid (hard framed brace) to prevent skin irritation and help with fitting. A few braces for your situation may be the Tru-Pull Lite, Lateral "J", or the DonJoy Performer Knee Brace. If you have any further questions about the products please don't hesitate to call us or email. I wear a knee brace and full length compression hose. Would the undersleeve for the brace be worn over or under the compression hose? An undersleeve for the brace is not needed. It should be worn if you have sensitive skin, or have a allergic reaction to the frame liner. Should you choose to wear it, I suggest wearing it over your compression wear. I have the nano, can i fold the top & bottom of the sleeve over the brace? You can fold this portion over the brace if you'd like. It may stretch the fabric out. If you are looking to cover the frame we do sell brace covers. Thank you for contacting DJO. I recently got a Playmaker II Fourcepoint Knee Brace and there are seams that rub the back of my knee, Would this sleeve help or would it be too think in combo with the sleeve of the brace? There is a thin Nylon material in the back of the knee to breathe and create additional comfort. If the side seams are causing the irritation, the brace may be too small. It is also not uncommon for there to be some initial irritation when wearing a new brace (much like wearing new shoes). You can try the undersleeve, however, it will add some bulk and deter the breathability. Thank you for your question and for contacting DJO. Do the sleeves prevent or minimize the sweat that gets on the brace lining and pads? The sleeves will provide protection for those with sensitive skin. It will place a barrier between the brace, straps, pads ect and the skin. Is the cotton/lycra material similar to wicking material in active wear where it will dry quickly? I'll be training for a half marathon during the summer months and don't want something that will hold onto sweat. I'm assuming the neoprene sleeve would be 'hotter' then the cotton/lycra sleeve. I have worn my brace over compression tights and have had no issues with brace slippage in the past. The original straps and paddings need to be replaced. I received replacement parts from the company a few years ago under warranty and they actually cause more problems than the original worn out straps/padding. I would just like to have an alternative option on hand. Thank you for your response. Yes, the cotton/lycra is cooler than the thick neoprene. Do you have a Defiance knee brace? We have replacement parts, pads, liners, you can order for your brace. We also have Chamois Liners for the Defiance, they wick mositure away. Please call a Product Specialist and we may better assist you. 1-888-405-3251. You should purchase the same size as your knee brace is. I have some questions on undersleeve sizing. I have a 21.5 inch thigh. Which size should I order medium or large? My Donjoy AO NANO braces are size large. Also, In the reviews, someone said to order 1-2 sizes larger than what the sizing chart indicates. And finally, in the Q&A section, there are two different lengths listed for the donjoy undersleeves. Which size, 16 inch or 18.5 inch is correct? You would want to order a Large undersleeve. Because the Nano is only 14" in length, you would want to go with the shorter length undersleeve. Are these sleeves free of latex and neoprene? The cotton/lycra undersleeve is free of neoprene and latex. If I purchase "one" of these sleeve(s) at $24.99 am I getting a pair or just one of them? Would I need to purchase two (price of $49.98) to get a pair? The description isn't clear. Each sleeve is $24.99 a piece. I wear the <a href='/donjoy-armor-knee-brace-with-standard-hinge'>DonJoy Armor knee brace</a> while playing football and a constant problem i experience is the brace sliding around on my knee which has lead to another injury. Would the Neoprene sleeve or the cotton under sleeve help prevent this more? The neoprene sleeve wouuld be more beneficial, You could also try the Silicone strap pad. I was wandering if i wear the knee sleeve with brace while playing <a href='/football'>football</a> and basketball if the brace would slip up and down while playing. 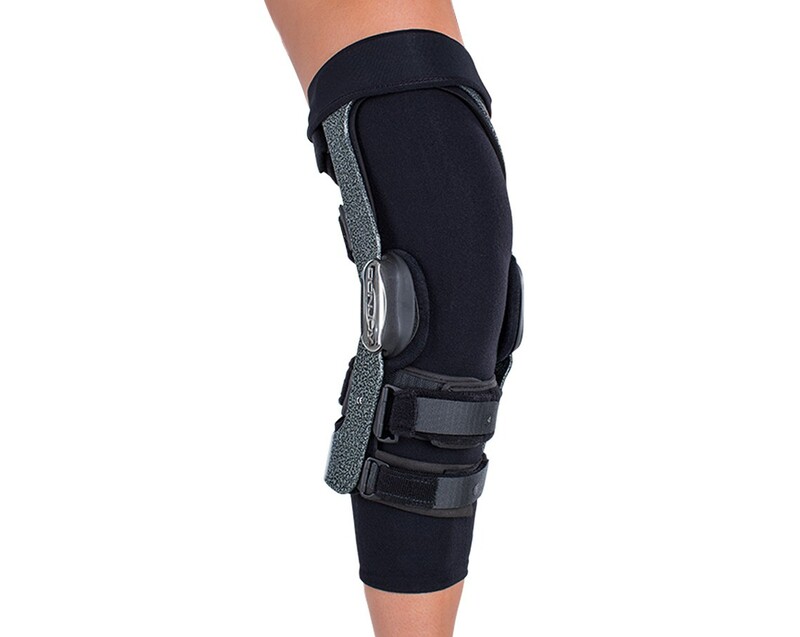 I am looking for something to relieve the pinching from the knee brace, but at the same time I want the knee brace snug will it will not move at all. I dont want to re-injure my knee. Thanks. Can you tell me the length of the sleeve? From top to bottom, my brace is 21.5' long and I have not been abe to find any sleeves long enough. The top of the brace is more than 6" above mid-patella. The undersleeves are only 16" in lengeth. How long are the knee brace undersleeves? I have measured my leg 6 inches above my knee. It measured 26 inches. Which size would be the best fit, XL or XXL? XL goes to 26.5 and XXL starts at 26.5. Please send us an email with your knee and calf measurements, taken in the exact same way. With this information we can get a better idea of the leg shape. No, I am sorry. They only come in black. Can you further explain the size chart? I am not sure what size is best for me. Will the knee brace undersleeve help with sweating and such from wearing the <a href='/knee-braces'>knee brace</a> outside on hot days? It will help in that it will help absorb the moisture. It won't keep the knee cooler, but it should make wearing the knee brace more comfortable. Does the cover give any extra protection or stability to the knee? This knee brace undersleeve is designed to protect the skin by adding a layer of comfortable material between your skin and the knee brace. It does not necessarily add any support or stability to the knee. There is a thin seam that runs the length of the sleeve on the back of the leg and very comfortable against the skin and under a knee brace. The DonJoy Knee Brace Undersleeve only comes in Black. Can the undersleve be worn with the OAdjuster Knee Brace? Also what is the difference between the Replacement Kit-Lateral and the Replacement Kit- Medial for the OAdjuster? They appear to be identical. If you have to wear a knee orthotic day in and day out for whatever reason, buy one of these. And personally, buy a couple, they stay pretty clean but a freshly cleaned and dryed one fits slightly better and has less roll to it. Only took off one star as I'd like to see this product in other colors... Maybe a burgundy, or grey. Since I'm in my knee brace most of the day, this product makes it easy to withstand any rubbing from the straps. Utilized with low leg, synthetic material, boxer briefs, I tuck the sleeve under the leg of the brief and leave enough to roll up on the bottom of the brace. I am able to go half of my 12 hour shift without any adjustments. Great Product - Don't Leave Home without it ! Always order 1 or 2 sizes larger than what you think you will need. This product provides much more comfort than not having one. Washes in warm water and let hang to dry. If you are having skin chafing, and discomfort, this is ONE OF THE FIRST THINGS TO TRY ! the sleeves are great. They make the 2 braces that I wear much more comfortable. I have only one complaint for mine is they have a tendency to slide down. Probably should order a smaller size next time. Great product but don't think all of their products sizes are the same. Good quality, comfort and price, but size chart is not accurate. Based on the sizing instructions provided on this website, I should have worn a "small", but ordered a "large" based on a similar product purchased at a local retail store. The large size fits well (even a little snug at first) and is comfortable and durable. The price is about a third of what I paid at the retail store, so I'm very satisfied with that. These undersleeves make wearing my knee braces much more comfortable. They reduce the abrasion from the straps and help keep my legs a little cooler. Sleeves have solved my problem of braces chafing my skin when worn for a longer period of time. I do think the $25 each and $11-$12 to ship socks is extremely pricey.